I don't know if it's the weather or advancing age, but my joints have felt recently like they need oiling. I can no longer leap out of a chair and dash to answer the phone, I get up and creak my way over. Bizarre. I'm hoping it's the weather. Just in case, I went to a herborist last weekend with a recipe for remineralising ye olde bones that I got from a magazine I subscribe to called Plantes & Bien-Etre. If you have joint pain, tiredness, breaking nails, hair loss, these could all be due to a lack of minerals which is due to an excess of acidity in the body rather than poor nutrition. The stresses of modern life block the elimination of acid so a helping hand is needed. 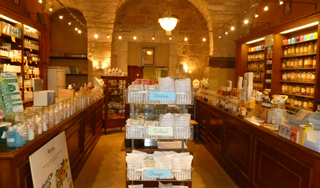 The shop, located in the old part of Montpellier, in a beautiful stone building, was fascinating. There wasn't much room to move about because it was filled with goodies. The walls were lined with jars of herbs of every description. My recipe posed no problem to the experienced herborist. She suggested she make three times the amount which would give me a cure of about one month. The bag cost me about €15 which I thought was very reasonable seeing all the good it was going to do me. The recipe is designed to stimulate the hepatorenal function and remineralise the body. Boil a bowl of water with one tablespoon of the mixture. Turn off the heat and cover for ten minutes. Filter and drink one to two bowls per day for six weeks, once or twice a year. Or you can drink it one week per month over several months. The article in the magazine says that you should act in three ways only one of which is drinking the tisane. The others are removing the sources of acidose: stress, milk products, animal proteins (bugger!) and industrial food (no probs, I don't touch the stuff); and increase vegetal sources of minerals - nuts, leafy veg. Tonight we're having roast chicken... with some leafy salad. Cut the top off the potimarron(s), and empty out the seeds. Pepper the inside. Fry up the lardons. In a bowl, mix together the cream, cooked lardons and chestnuts, and add salt. Cook at 180°C for an hour and a half. What I did: I used less cream and lardons, added turmeric and garlic to the mix. It was very tasty. Balsamic syrup (boil up cheaper Balsamic vinegar until you get 1 tbs of syrup). The recipe calls for lardons but I left those out. Toss the sprouts in the oil and salt & pepper. Roast the sprouts in the same oven until cooked. Add the chestnuts for the last ten minutes or so. Take out of the oven and dribble over the vinegar. Toss. Check the seasoning and serve. Post by Collective Evolution Lifestyle. Who knows, I may even end up standing on my head again. I haven't done that since I was about eight. Or not. I hope it works for you Sarah! Over winter I eat soup every day and it's all made with homemade chicken bone stock. I don't know if it's a coincidence but my nails are as strong as titanium now. Good luck. To keep my youthful look, I swim three times a week. But I'm afraid all the chlorine, speeds up my hair lose. Bummer. I love my beautiful blond hair!